Powers/Abilities: Clear-Cut possessed the superhuman power to generate blades from his body, often generating full swords out of his palm. He was also an extremely skilled swordsman. History: (X-Force I#62 (fb) - BTS) - The man known as Clear-Cut came from a long line of noble warriors. At some point, Clear-Cut developed the non-mutant superhuman power to manifest blades from his body at will. Owing a debt to X-Force's leader Cable, Clear-Cut went undercover, posing as a mercenary, within Shinobi Shaw's organization. As part of Shaw's organization, Clear-Cut helped train Shinobi Shaw's armored guards. (X-Force I#62) - Overhearing the guards threatening to shut the young mutant test subject Leong Coy Manh up, Clear-Cut asked Shinobi Shaw if the guards knew they could hear everything they were saying. Shinobi promised that the guards would be dealt with but Clear-Cut suggested they kill the guards now and be done with it, suggesting that the guards could not be trusted to keep Shinobi Shaw's secrets. Clear-Cut then watched as Shinobi had his scientist Dr. Graves experiment on Leong's sister Nga and angrily thought how Dr. Graves probably enjoyed torturing little girls. The conversation was interrupted when an alarm went off, announcing that X-Force had entered the facility. Shinobi Shaw immediately ordered Clear-Cut and his other agent, Mindmeld, to make their visitors feel welcome. Moments later, Clear-Cut and Mindmeld, alongside several armed guards, confronted X-Force, where Clear-Cut ordered X-Force to drop their weapons if they wished to leave alive. When X-Force refused, Clear-Cut engaged Shatterstar and the two fought a heated sword fight before Clear-Cut turned his attention towards Caliban, who also shared Domino's psyche due to an attack from Mindmeld. Once all of X-Force was captured, with Clear-Cut secretly giving Domino a key to unlock X-Force's inhibitor collars, Shinobi Shaw gloated about his victory and offered Sunspot a place in his new Hellfire Club but Sunspot refused. Shinobi Shaw then revealed he had discovered Clear-Cut's ruse, ordering his guards to draw their guns on Clear-Cut. Making short work of Shinobi Shaw's guards, Clear-Cut was eventually downed by Mindmeld and taken in for experimentation. Placed in an experiment chamber, Clear-Cut remained brave despite Mindmeld's psyche still being in his mind, thinking that if he had to die, Mindmeld would die with him. X-Force soon arrived, having escaped their collars thanks to Clear-Cut's prior aid, and began destroying Shinobi Shaw's labs. Mindmeld eventually was able to leave Clear-Cut's mind but found her true body inside an inhibitor collar thanks to Meltdown. Despite X-Force's destruction of the lab, Clear-Cut's bio scan was able to proceed, revealing no mutant gene and leaving Clear-Cut unconscious. Domino got Clear-Cut to safety and attempted to revive him, only to be attacked by Shinobi Shaw. 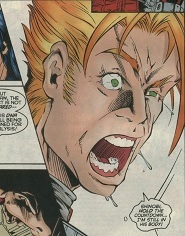 Before Shaw could solidify his hand into Domino's chest cavity, Clear-Cut revived and confronted Shaw, who was shocked that Clear-Cut could still manifest his blades despite not being a mutant. Clear-Cut then knocked Shinobi Shaw aside and renewed his attack when Domino also attacked Shaw. Meltdown eventually completely destroyed Shinobi Shaw's lab and both Clear-Cut and X-Force escaped to safety. 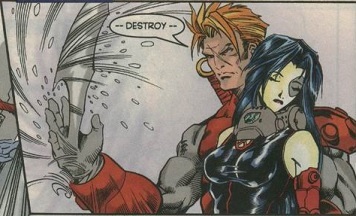 Outside the destroyed lab, Meltdown thanked Clear-Cut for his assistance and Domino questioned Clear-Cut's abilities since she knew he was not a mutant. Clear-Cut replied by calling Domino arrogant, suggesting not all superhumans were mutants, before telling Domino that his debt to Cable had been paid. (Civil War Battle Damage Report - BTS) - While viewing files on loose ends following the first superhero civil war, Tony Stark viewed a file on Clear-Cut and considered him a potential Initiative recruit. Comments: Created by John Dokes, Kevin Lau, Adam Pollina, Andrew Pepoy and Norman Lee. Dr. Graves was a scientist working for Shinobi Shaw who was tasked with halting the development of superhuman powers in mutants. After Shinobi Shaw captured Leong and Nga Coy Manh, Dr. Graves led the experimentation on Nga, who continued to exhibit the mutant gene. Failing the first time, Dr. Graves tried a second time to repress Nga's mutant genes on Shinobi Shaw's orders, much to Clear-Cut's dislike, who thought to himself that Graves must enjoy torturing little girls. Failing a second time, Dr. Graves insisted that more tests needed to be ran but Shinobi Shaw reminded Graves that he was only interested in results, not tests. The experiments were interrupted when X-Force stormed Shaw's lab and when X-Force was captured by Shaw's agents, Dr. Graves prepared Meltdown, claiming that she would make a fine test subject. After Shinobi Shaw exposed Clear-Cut's undercover status, Dr. Graves was tasked with using Clear-Cut as a test subject. Despite Dr. Graves insisting that Clear-Cut's DNA still needed to be scanned for the mutant gene, Shaw ordered Dr. Graves to continue with the experiment despite the psyche-swapping Shaw agent Mindmeld still being inside Clear-Cut's body. As the escaped X-Force began destroying Shinobi Shaw's labs, Dr. Graves continued scanning Clear-Cut's DNA, ultimately learning that Clear-Cut was not a mutant. When the freed Clear-Cut hurled Shinobi Shaw into Dr. Graves, an angry Shaw announced that Dr. Graves had failed him for the last time. Shaw then phased his hand into Dr. Graves' neck and solidified, instantly killing Dr. Graves before Domino and Clear-Cut renewed their attack on Shaw.